Create an account, copy the code, and paste it on every page of your site. Easy, right? 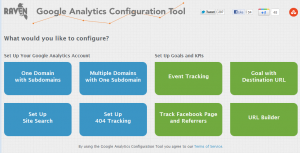 If you’re just starting out using Google Analytics, you may not be aware of all the advanced code implementations available, much less how to modify the code for your needs. But if you are tracking across subdomains or multiple domains, or if you want to do some advanced tracking with events that’s exactly what you need to do. To make matters worse, navigating through the labyrinthine administrative interface to find the tracking code snippet can be somewhat daunting. Especially if you’re used to the old version of the interface. And although the code wizard in GA does include several configuration options, the instructions are neither complete nor easy to follow for beginners. There’s also a URL builder for tagging your URLs with campaign parameters. Besides just giving you the snippet of code, the GA config tool leads you step by step, asking questions about what you’re trying to track and then providing the code and instructions of what to do with it. It also provides the code in either asynchronous or the traditional ga.js. This is a godsend for people who don’t deal with GA on a daily basis. Trying to figure the correct code configurations has generally meant wading through a sea of posts in the help forums, where the information is often outdated and inconsistent. This tool takes the guesswork out of the setup, letting you focus on what matters – your data! Coming from the folks who also created the Schema Creator (for creating structured markup for your site), not to mention their core suite of internet marketing tools, this will be an essential addition to many digital marketers’ arsenals. They’re already working on adding functionality to help with regular expressions, setting up filters and other points of analytics confusion. Go try this tool out and let us know what you think. Are there any other GA-related instructions you’d like to see added? What is it about GA that is most confusing to you?